Photo by New York World-Telegram and the Sun. Paul Ricoeur famously identified Nietzsche, Marx, and Freud as the “masters of suspicion.” They saw what most held sacred, and looked for the man behind the curtain. But there are other ways to disclose the man behind the curtain, and perhaps better ways—such as through a hermeneutics of love. Love is a way to be with a person that does not coerce the hidden truth to the surface, but rather cultivates a trusting openness by which the other comes to reveal him- or herself on his or her own terms. 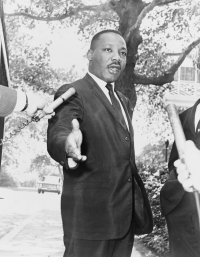 Martin Luther King, Jr. was a Servant of a Hermeneutics of Love. He believed that, if you want to change people, you have to love them. And if you try to change them through violence, coercion or hatred, you end up undermining your entire project—you defeat the purpose of your attempt at coercion. The ends do not justify the means. If we wish to change society, Dr. King taught us, we must love our enemies. When we are met with hatred, we must return it with love. When we are met with blunt physical force and violence, we must refuse to back down yet refuse to return hate for hate. The aim is not to accept defeat, but to accept nothing less than friendship and understanding from our enemy. He taught us that this point of view is not a strategy, but rather, a way of life. It is difficult to see the potential for friendship in our enemies. Our natural inclination, rather, is to totalize the enemy. This makes it all the easier to kill him. But to kill him is to enter back into a cycle of violence that finds no end, and which forecloses the ever-receding realization of a beloved community of equals, bonded in brotherly and sisterly love—agape love. It is difficult to accept blows from our enemy and yet refuse to return violence for violence. To accomplish this, Dr. King and Gandhi taught that the key is to have faith—a faith that suffering is redemptive. What cannot be reasoned to, what cannot be won with an argument, can be won with our own suffering. And what can be won is the heart of our enemy, who comes to recognize our dignity in his or her inability to take it from us by force. This dignity of the person is where freedom resides. Someone can force me into a cell. They can torture me. They can break my bones. But they cannot take my dignity. My dignity is intrinsic to me, and cannot be stripped, unless I choose to hand it over. By refusing to hand over my dignity, and in my willingness to suffer, the enemy’s heart is eventually won. And from that place of respect, genuine forgiveness and friendship may then blossom. The beloved community can become reality. To accept this lesson is to take a leap of faith across an abyss. It demands a willingness to believe that the universe indeed bends toward justice. There is hope.